InfinityLock Ransomware is one more application that is designed by cyber criminals so they could make illegal profits from unsuspecting Internet users. If you are not familiar with ransomware programs, you should know that they are crafted to encrypt vast quantities of data. Once that is done, developers such applications demand a ransom in return for decryption services. To have an in-depth knowledge of the intricate inner workings of this malicious piece of software, be sure to read this article. Additionally, our research team has compiled a few simple, yet extremely effective virtually security tips that will allow you to maintain a fully secure at all times. Finally, we also present a comprehensive removal guide that you should carefully follow to delete InfinityLock Ransomware once and for all. 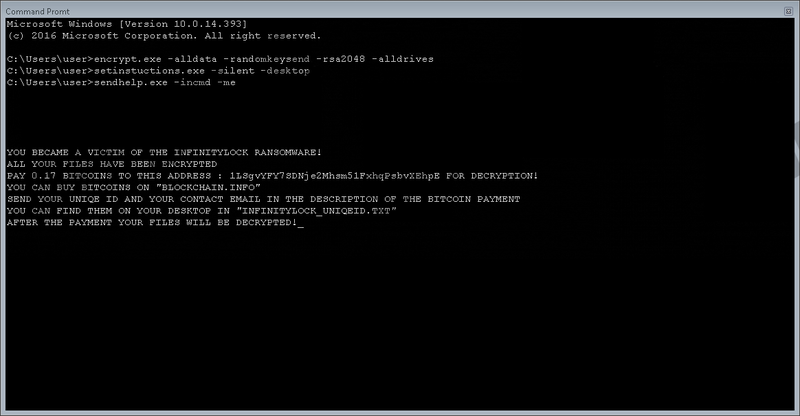 InfinityLock Ransomware functions quickly and aggressively. Once it enters your operating system, it immediately determines the contents of your entire hard drive. After that, it instantly starts the encryption procedure. It is not surprising whatsoever that the encryption process is quick and silent; most developers of ransomware programs design them in such a way so the malicious application would not be detected in action. During the in-depth analysis, our malware experts have noticed that this malware affects data located in folders such as %PROGRAMFILES%, %PROGRAMFILES(X86), %USERPROFILE%, and others. Thus, due to the malicious functionality of this program, a large number of your applications will no longer work. It is also important to note that InfinityLock Ransomware does not affect any files that are essential for your operating system's overall functionality. Unfortunately, manual decryption is out of the question because every single file is locked using a robust cipher that is known as RSA-2048. The devious application should also change your default Desktop image once your data is no longer accessible. Finally, after the encryption procedure is over, you will notice a ransom note entitled InfinityLock_UniqeID.txt. It contains information about what has happened and also an address to which you should make a transaction of 0.17 Bitcoin in return for decryption services. While at first, it might seem like a viable way to regain access to your files, you must be warned that cyber crooks responsible for this malware are not bound legally to decrypt your data even if you abide by their demands. Thus, you could lose not only valuable data but a large sum of money as well. It should be more than obvious that you must remove InfinityLock Ransomware at the very same time that it is discovered up and running on your personal computer. If you are a security-conscious user that wants to avoid programs such as InfinityLock Ransomware, you must take preventative measures to improve your overall virtual security. Our researchers have discovered that this application is often disguised as a crack for Adobe Premier and is hosted on questionable third-party sites. Thus, you can significantly lower the risk of coming across such devious installers by refraining from all dubious web pages. Malware developers nowadays also favor spam email campaigns as a way to spread their intrusive applications on a large scale. Therefore, it is quite natural that we urge users to avoid all email attachments that come your way from unknown third-party sources. Furthermore, we encourage you to always learn about a program and its developers before obtaining it since cyber crooks are infamous for using hoax advertising to trick users into downloading and installing their devious programs. Finally, and most importantly, every user needs to have a professional antimalware tool running on their PC at all times. Such a tool is paramount because it can detect and remove any virtual threat before it enters your PC. By taking these simple precautionary steps, you will be able to keep your PC safe and secure at all times. It goes without saying that you must terminate InfinityLock Ransomware as soon as possible. Make sure not to rush the termination procedure because a single missed step could result in an incomplete removal. If that happens and traces of InfinityLock Ransomware remain fully active on your personal computer, the malware in question could continue its malicious functionality. There might also be a possibility that leftovers related to this devious program could trigger its restoration without your knowledge. To be sure that every single bit of this malware has been deleted, you need to check your entire operating system for anything associated with InfinityLock Ransomware right after you are done with the instructions below. Right-click a malicious .exe file and then select Delete. The name of this file is usually random. Right-click the Recycle Bin and then select Empty Recycle Bin. Quick & tested solution for InfinityLock Ransomware removal.